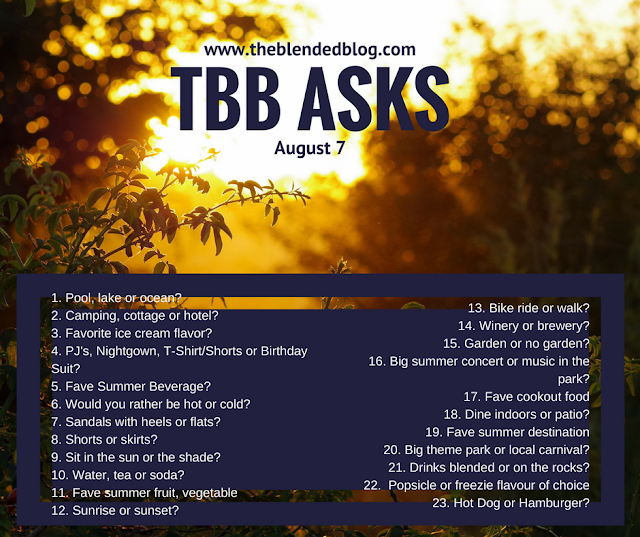 Welcome to another edition of The Blended Blog Asks - my friends and I at the Blended Blog come up with a bunch of questions and it makes for an easy and fun post for us and you! 1. Pool, lake or ocean? 2. Camping, cottage or hotel? I've done my fair share of camping but if we're being honest, I'd much rather sleep in a comfy bed where bears can't get me lol. I LOVE going to a cottage and just chilling but there's also something fun and exciting about staying in a hotel. Again, I'm not really answering the question am I? In short, for relaxing and enjoying the outdoors, cottage it is. If I want to explore a new city and enjoy luxury, hotel all the way. You're asking the pregnant lady? Give me ALL the ice cream!!! There's few flavors that I don't like but if I HAD to pick one, I'd probably opt for french vanilla. 4. PJs, nightgown, t-shirt/shorts or birthday suit? Depends on the time of year. In summer I'm usually in underwear and a t-shirt, in winter it's pjs. Neither lol but if I HAD to pick, I guess cold, because then I could add blankets, turn on the fireplace and get all cozy. 7. Sandals with heels or flats? If they didn't hurt my feet I'd do heels all the time. Having said that, I'm VERY pregnant this summer so it's been consistently flats for this momma. Depends what I'm doing. Shorts are easier if I'm out and about with the kiddos because I don't have to worry about flashing anyone my undies. 9. Sit in the sun or the shade? 10. Water, tea or soda? How about coffee? I always have my water with ice with me. Fresh picked strawberries and corn on the cob!! YUM! Sunrise. It's such a quiet and calm time of the day. 13. Bike ride or walk? Walk. I haven't rode a bike in ages and given my 8+ pregnant-status, riding a bike isn't an option at this point. Have you met me? Winery ALL the way!! 15. Garden or no garden? Does my planter hanging from the fence with 3 pepper and 2 tomato plants count? 16. Big summer concert or music in the park? I love a more intimate venue - as long as there's good music and tasty drinks are always nice. 18. Dine indoors or patio? If the weather is right, patio is where it's at! Does the back deck count? We don't have a regular go-to summer spot besides spending as much time as we can outside. 20. Big theme park or local carnival? BOTH! We've got little people so either are a hit! I feel safer on rides at a big theme park but there's nothing like a local fair :) We've already been to a few this summer (one today actually!). 21. Drinks blended or on the rocks? I don't usually do sugary drinks but I guess blended seems more summery to me. 22. Popsicle or freezie flavor or choice? I used to LOVE banana popsicles... I don't even know if they still make them. I can't pick (shocking) both hotdogs and hamburgers are summer staples around here and I love them both equally... and now I'm hungry (also shocking, I'm sure). Make sure you check out how the other ladies answered and feel free to grab the photo above, answer the questions and linkup with us below!